Carpets are a costly investment which you won’t want to keep replacing. So, it is more efficient to keep them clean as recommended by the manufacturer. Carpets often should be maintained at least once a year. Not only does the regular carpet maintenance kill all the germs and bacteria in the carpet, but it also prolongs your carpets lifetime. Our professional cleaners are one of the best in the business, they will get the job done in no time at all. Many London carpet cleaning customers choose Magic’s carpet cleaners in Clayhall IG5 for our fast drying times as this allows them to have quick and efficient cleaning as and when required. Our main goal as Clayhall carpet cleaners is to provide you a fast, effective and friendly service which you are happy with. We ensure that our carpet cleaners are fully qualified and vetted. We know how important your home is to you and we would like to exceed your expectations. Magic London Carpet Cleaning in Clayhall IG5 has an extensive knowledge of carpets and carpet cleaning and are ready to advise clients on carpet and its maintenance. We are keeping our customer support lines always open. Fell free to ask our assistants everything about our services. You will get a price quote if you provide us additional information about your property dimensions. 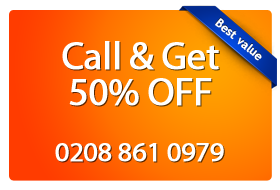 Call us now on 0208 861 0979, or use our on-line booking form.